Yesterday I mentioned that the old chambray shirt was incorporated into three additional articles of clothing. I know you've been on pins and needles, so here they are. First off, I made a little summer outfit for Miles. He looks so adorable in it, just imagine him wearing it, because by the time I managed to snap some photos of him in it, it was covered in applesauce. My mom found the t-shirt at a garage sale for a quarter. The smart woman saw the potential, and just by adding a small pocket detail, we transformed the t-shirt. I cut a small triangle of fabric, that was 1/4" wider and taller than the pocket. I folded the raw edges under 1/4" on both sides, and left the diagonal raw. I pinned it in place, stitched around all sides, and added a couple of extra stitching rows on the diagonal for added detail. The raw edge will fray, and I'm looking forward to it. It will only unravel 1/8", because I sewed that close to the r.e., but it will add a bit of texture to the shirt. The three rows of stitching also repeat a design detail from the shorts. 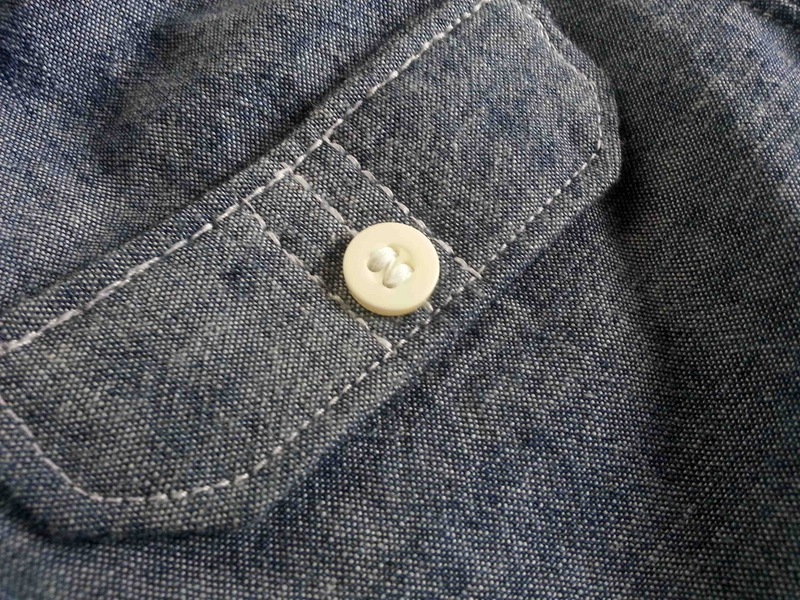 You can see on the back pocket flap that there are three rows of stitching down the middle. I used a pair of Miles' existing shorts for the pattern. They are pretty basic. A faux fly, front pockets, and back faux flap pockets. They really didn't take much time at all, and given that I already had the buttons, the shirt material for the shorts, and the t-shirt from my mom, the entire outfit ended up costing about a quarter. The last article is a bit of a repeat. I embellished on of Clark's t-shirts that I snatched up at Wal-mart at the end of last fall ($1 on sale), and added a contrast pocket. 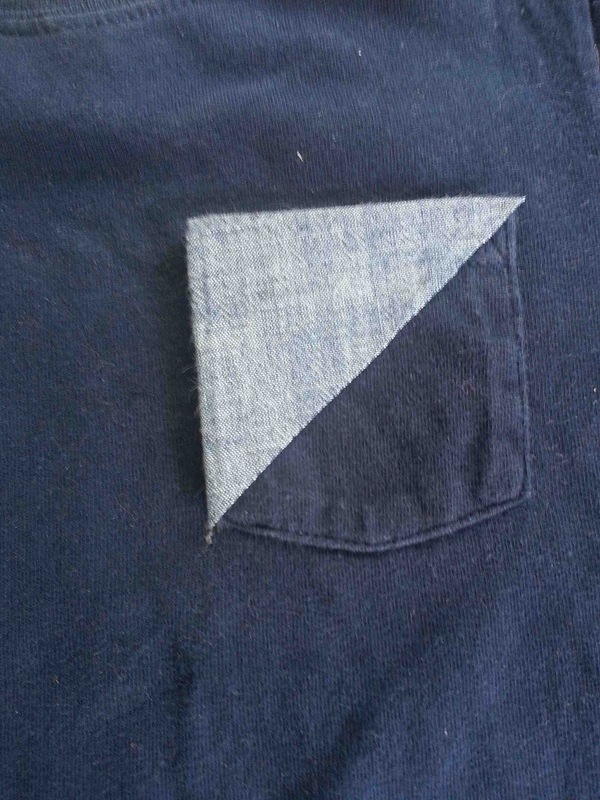 This is the actual pocket from the chambray shirt. I used my seam ripper, and carefully removed it. Then, I added a bit of red stitching to the pocket yoke (? 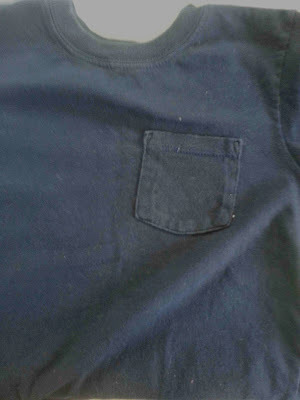 ), cut the pocket down a bit, and turned under the raw edges. Then I positioned the pocket, and used that red thread to secure it to the t-shirt. I love this little shirt. 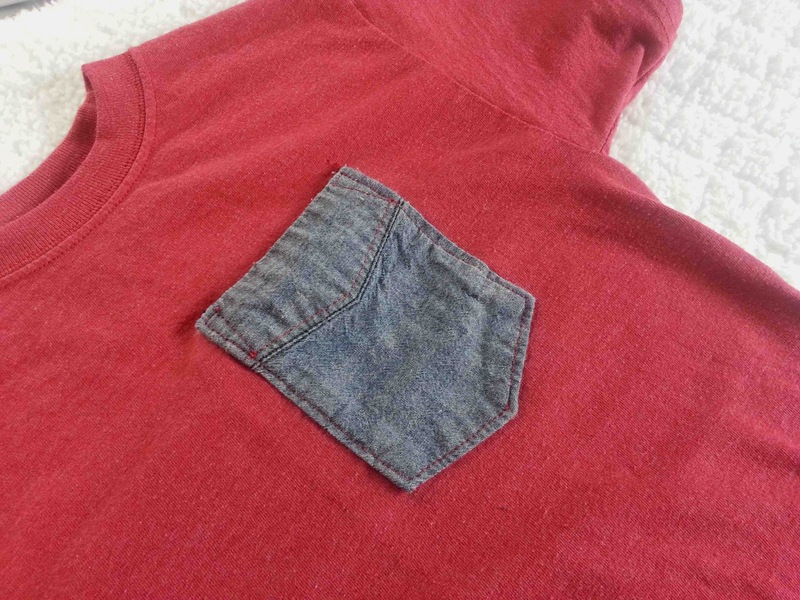 It's silly that something as simple as adding or embellishing a pocket can create so much interest to a plain t-shirt, but it does. So so so cute. And perfect for a baby boy. So current styled and everything. 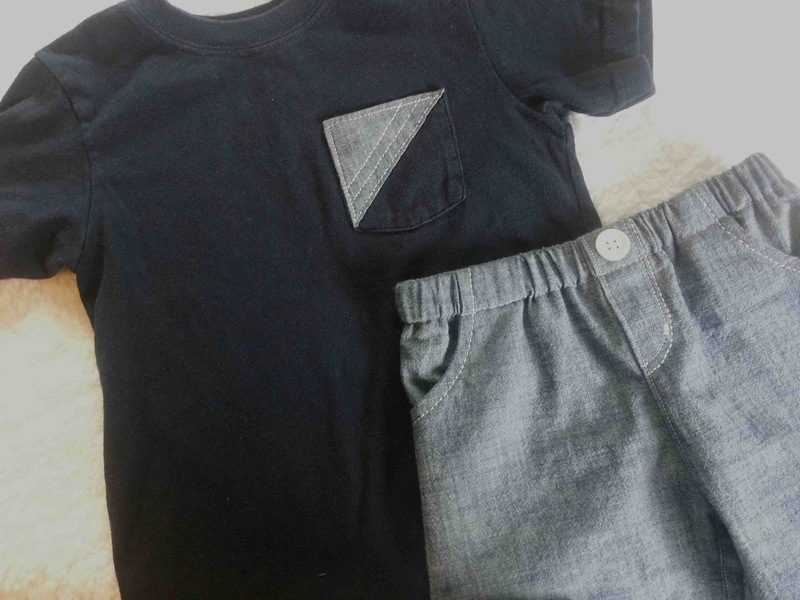 Can't wait to see a baby in those adorable clothes! 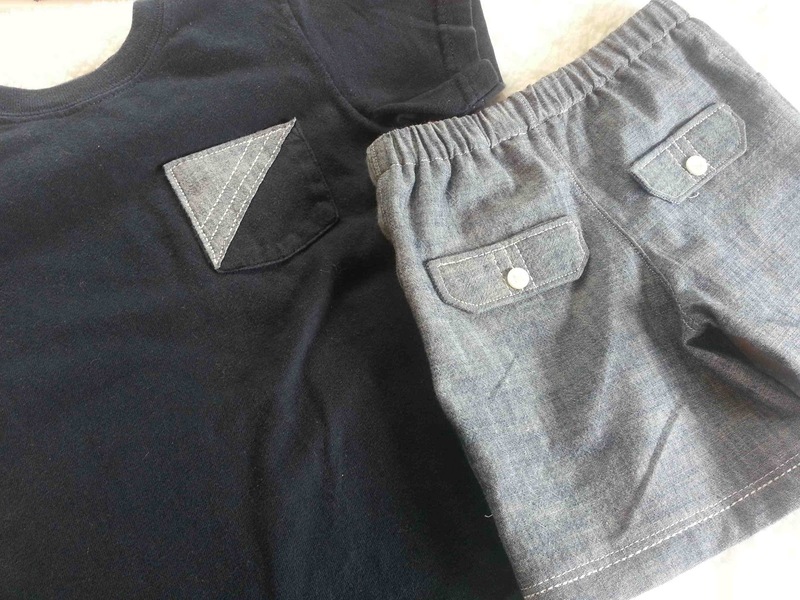 Amazing how the simple pocket addition changed the tee... very nice! 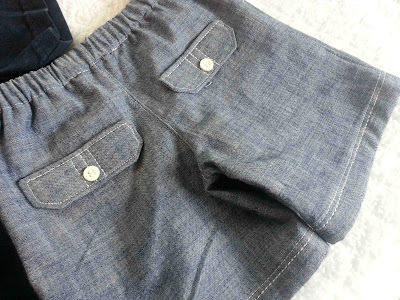 And I love all the top-stitching and details on the shorts.